I've been getting back into my sewing lately, and have been making myself a few things to wear. 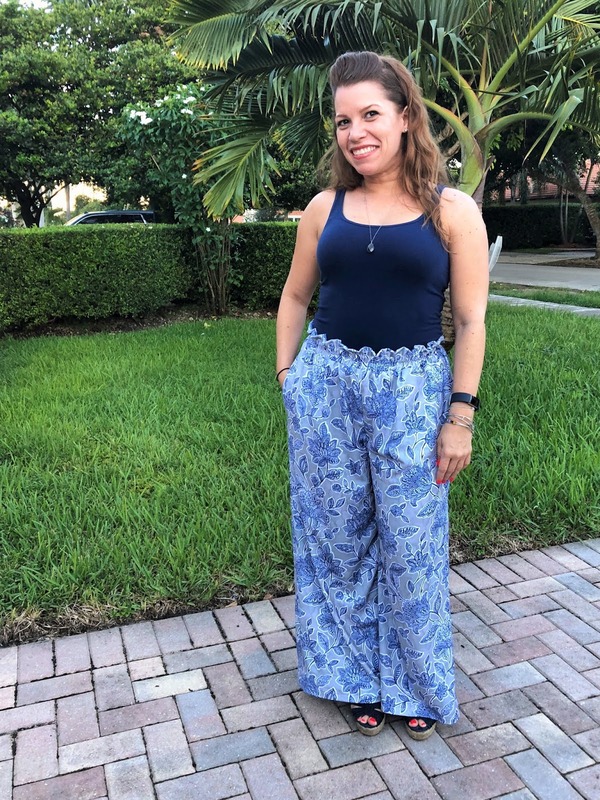 I saw these kind of wide-leg pants at a boutique I shop at and decided to try making a similar pair. I found a pattern, Simplicity 8605, and got some fabric a JoAnn's. The best part of the pattern was the pockets! Gotta love pockets. Putting the pants togther went very smoothly, but the hardest part was getting the elastic through the 2 channels. Getting them both to come through at the same time without losing one of the other was one of the most time consuming parts of making these. My fabric choice didn't make this any easier. It was a little too heavy for this project, but it worked. Between the pockets in the front and the waistband, there was a lot of fabric to deal with. These are super comfy, kinda like pajama pants, but the fabric made them good to wear to work. It was great to whip up something that came together so fast. I think I'm gonna have to try my hand at making something else soon.